Consulting Services – Virtual Ability, Inc. Virtual Ability offers a range of virtual world services that help our clients improve the accessibility of their projects and their virtual world environments. Virtual Ability, Inc. has years of experience working with people with disabilities in online virtual worlds. We know how to build a virtual environment, we know how to build a community within it, we know how to make a virtual environment more accessible for everyone, and we know how to help you achieve these same results. We have worked with a wide variety of prestigious foundations, academic institutions, and government agencies. See our Project Page for some of the success stories we have enabled for our clients. Our rates are reasonable, our experience unparalleled, our quality impeccable, and helping ensure your success as you undertake your virtual world project is our unqualified commitment. When virtual world presentations are given in Voice, those in the audience who are deaf or hearing impaired, or whose native language is not that of the speaker, may not know what is being discussed. Similarly, when online presentations are given in text, those who are dyslexic or have low vision may have difficulty following the presentation. Virtual Ability provides transcription services within Second Life and other virtual worlds to assist in both these directions. Voice-to-Text (V2T) transcription provides a typed meaning-for-meaning (not word-for-word) real-time text for the audience to follow. Many event organizers appreciate having a typed transcript of spoken presentations. Text-to-Voice (T2V) transcriptionists read aloud the text offered by the presenter. VAI’s transcription service is headed by LoriVonne Lustre. LoriVonne has long been an advocate for persons with disabilities in her home province of Nova Scotia. She initiated the project that brought closed-captioning to educational videos at the Nova Scotia Community College where she works supporting online learning and educational technologies. For more information on VAI transcription services, please contact Gentle Heron in world, or use the contact form on this web site. Let Virtual Ability, Inc. evaluate your existing or proposed virtual world venue, club, store or project and recommend ways that you might make it more accessible for participants with a wide range of impairments. There are many simple things you can do that make a world of difference for the differently-abled members of your audience. Adding an invisible barrier to a rooftop venue to help people with fine motor skill issues. Effectively using the “description” tag on virtual objects so those with vision issues and using a screen reader can see your signs. Incorporating (not segregating!) seating that is welcoming for those whose avatar is in a wheelchair. Contact us and we’ll be glad to discuss how we can help ensure you are able to reach all of your audience. New residents in a community are more likely to stay and engage with community members if they are welcomed into the group. New residents to a virtual world often need assistance in learning how to function in it, especially if they have disabilities and use assistive technology. VAI Mentors are trained to assist those with disabilities who come into Second Life. Mentors provide support as the new resident learns how to create a virtual existence, whether that means going shopping or providing landmarks for different venues such as music. Mentors also assist new residents who have a disability and need to learn what assistive technology and in-world support resources may be available to them. 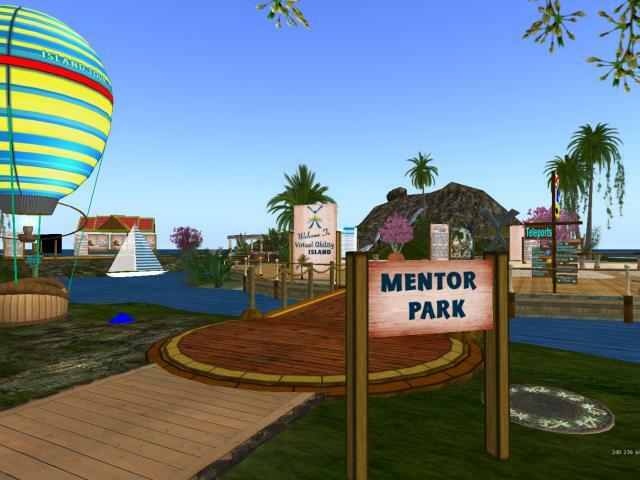 This link allows new Second Life members to start their experience at Virtual Ability’s award-winning Orientation Path. Groups, such as a University class, are always welcome to come through VAI’s orientation. Anyone who wishes to bring in a group and would like to have Mentors available for assistance, please email Virtual Ability to make arrangements. VAI Greeters act as hosts and hostesses for Virtual Ability events. They provide assistance to audience members before and during an event, such as helping them set their sound or media preferences.